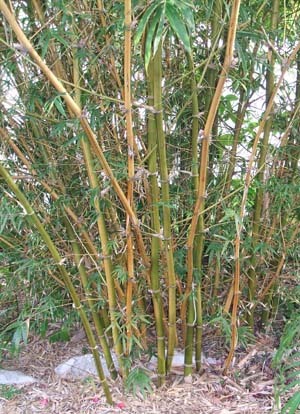 Bambusa ventricosa Kimmei, common name: Kimmei Bamboo, also identified as Bambusa tuldoides 'Ventricosa Kimmei' has yellow culms with green vertical stripes. Minimum USDA hardiness zone: 8B. This is a great bamboo that was given to me by the late Richard Waldron. He told me an interesting story about how he first got it from a woman he met at a bamboo show who supposedly smuggled it in from Japan, so I was very surprised when he dug up his only plant and gave it to me. I still have no idea if the story was true, or if he just liked to make things interesting.